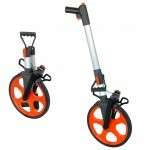 The USDW1000M is a 12.5" diameter measuring wheel. Models measure in Ft./10ths or m/dm. The USDWPROM-0 is a 12.5" diameter measuring wheel. The PRO boasts a Counter-Clear control mounted on the pistol grip as well as a trigger operated brake. It comes complete with the Cordura case. 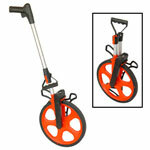 These measuring wheels are professional grade tools built for rugged commercial use. There are two models: USDWPROM-0 and USDW1000M all available in either Feet/10ths or meters/decimeters. 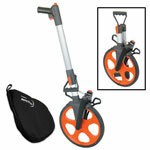 Carrying cases are available for convenience and protection of your measuring wheel. The USDWPROM-0 boasts a Counter-Clear control mounted on the pistol grip as well as a trigger operated brake. It comes complete with the Cordura case.